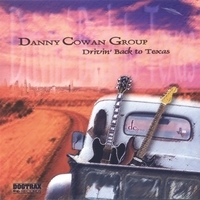 HOT-HOT-HOT Texas Blues Rock featuring Danny Cowan's smokin' tasty guitar and Tracey's smooth, sultry vocals. If you like your guitar TEXAS HOT, you've come to the right place! The Danny Cowan Group is all about original music centered around hot guitar, emotional vocals and musical roots. They have recently completed their debut album "Drivin' Back to Texas" which has already received great acclaim through digital internet avenues. "You sound great! I was very impressed with the professionalism and musical virtuosity of your band. The vocals and instrumentals were thoughtful and inspiring!" Roger McGuinn, of the legendary 60's group "The Byrds"
"The Danny Cowan Group Serves up some HOT Texas style blues. All the Texas guitar tone is there, along with another Texas tradition, a fine female blues singer fronting the band. This is a classic Texas recipe for good blues...pop open a Lone Star and enjoy! " "The Whip - Here's a driving groove a-la 'Cold Shot', but by no means a SRV clone. Classic Texas sound without apeing all the cliches! " "Runnin From The Devil's guitar work is excellent. "Here's a POWER Tradition from the line of the masterful Stevie Ray Vaughan! This emotional duo knows what to do about the blues - Just Keep On Rockin! Tasty guitar is good for your heart & soul so settle in for a banquet of personal pain & regret that rivals good ole' EC! " Incredible Guitar Work and True Hearfelt Vocals! You could have slapped me silly when I checked out samplings of DC music. I was kind of taken back when I saw two pale faces after the listen. I guess you can never know who is going to have the blues inside them waiting to get out. Strong, soulful vocals, and a guitar that compliments, rather than interferes with the vocals. Extremely tasteful playing, with a slight undertone of the hurricane waiting to be unleashed ! This a very tight band for a first recording,and and we can only hope for their continued pursuit of defining the blues in their very special way, and hopefully gaining the wide acceptance they so richly deserve. This is magic in the making !